Week 1: What to ask your lender before you buy a home (it’s not a pre-approval!). Week 2: Why it’s important to figure out your monthly budget. Week 3: How to determine how much you really need for a down payment. Week 4: Why your credit score can hurt or help your loan options. 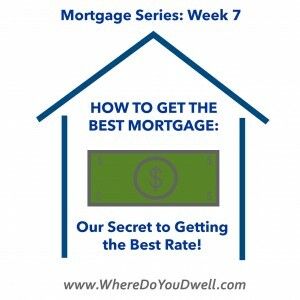 Week 5: How to get the lowest interest rate possible. Week 6: When you should or shouldn’t avoid PMI. This week’s topic takes you to the last stage of the mortgage process and how to “seal the deal” on the best interest rate. Here’s what you need to know about when and how to “lock in” your loan and our dirty little secret to guarantee you get the best interest rate out there. We’ll give you the basics first, and then share our own secret plus a bonus tip too! When should you lock-in? You can only lock in once you are under contract, not before. Once you go under contract, contact all the lenders you may want to work with to compare rates. You MUST contact them on the same day, generally at the same time of day because interest rates change all day, every day. What to look for from a lender? Remember to shop around for a lender during the pre-approval process first, which we discussed in Week 1. Meet or talk with at least three lenders and see what they will offer in terms of interest rate, points, and fees, including any lock-in fees (which may or may not be refundable). Once you get the quotes from the lenders (remember at least 3, see advice above) and you know which bank and lender is giving you the best interest rate, go to one of the other lenders and ask them to “beat it” so they can win your business. Sometimes lenders will give discounts or special pricing so they won’t lose potential customers. This is our dirty little secret and it will help you truly get the very best mortgage and interest rate possible. But, wait! There’s more! We have a bonus tip for you! Let us know if you have any questions on locking in your rate and our secret strategy! We hope you enjoyed our How to Get the Best Mortgage Series. We look forward to bringing you more informative series.